Teacher and scholar, leader and innovator, you have devoted your career to the highest principles of education, service, and global engagement. As founding dean of the Steven J. Green School of International and Public Affairs, at Florida International University, you inspire and educate those who are eager to serve as leaders and changemakers, in our globalized world. As a Professor of Politics and International Relations, and a Professor of Law, your career has been one of devotion to challenging and mentoring your students. You are also a skilled administrator, who oversees eight academic departments and more than 20 of the university’s most prominent international centers, institutes, and programs. Among these is FIU’s Model United Nations, ranked second in North America, which holds a special place in your personal history: during your junior year at Stonehill, you went to New York City to participate in the National Model UN program, where you acquired skills in the art of diplomacy and compromise, which have proved invaluable in your career. You have kept close ties with your hometown of Brockton, and with Stonehill, from which your sisters, Pamela and Nancy, also graduated. You credit Stonehill with preparing you for life and career, and you return to campus often for presentations and events, and to serve on the Advisory Board of the Martin Institute. 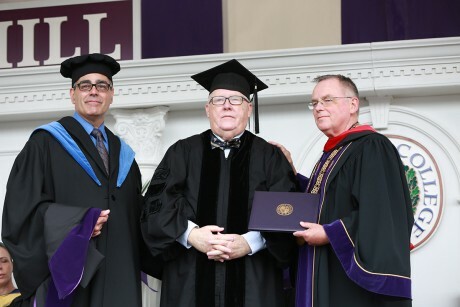 For your commitment as an educator dedicated to creating a global community that thrives through understanding, connection, and kinship, we are proud to bestow upon you, Dr. John F. Stack, Jr., honoris causa, the degree of Doctor of Humane Letters.